A 2017 Professional Development Bursary exploring open access production space in relation to my role as co-director to Paradise Works, Salford, and my own creative practice. My art practice is research led and often use objects, materials and process to explore the documentation of the human condition in material culture and place. 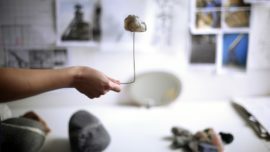 I use the language and practice of social sciences and museum studies to create sculpture, installation and public activity which explore the function of collection and heritage. I studied Three Dimensional Design where I enjoyed a multi-disciplinary approach to materials before completing a MA in Jewellery & Related Products in Birmingham’s historic Jewellery Quarter. I’ve been interested to appropriate the language of different processes and disciplines since graduating in 2008. I work from, and co-direct Paradise Works, Salford, and teach Critical & Contextual Studies at University of Salford School of Arts & Media. In 2016 I coordinated and curated the Place + Production programme for Rogue Artists’ Studios which marked the group’s final year at Crusader Mill. During this time I became interested in the place for making in the city as development continues to push industry out. This blog will record my research visits and thoughts about the place for making in Manchester and my own practice. 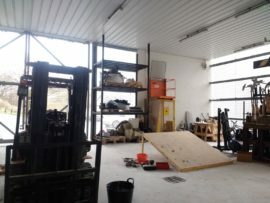 I visited Blackhorse Workshop, London, and Edinburgh Sculpture Workshop in December, and earlier this year I also visited the proposed site for Birmingham Production Space to speak to Ruth Claxton. In the end the visits were a bit more scatter gun than planned but each offered different approaches to make space, and I’m still processing this really. This last blog post tries to surmise the key points, apologies in advance for the equally scatter gun approach. 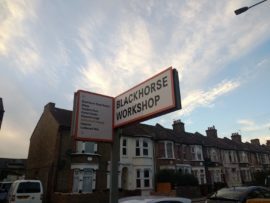 Blackhorse Workshop presented an interesting case study for open access space and community engagement. BW has wood and metal working spaces available for hire on half or daily rates, available to individuals who’ve attended the relevant inductions. 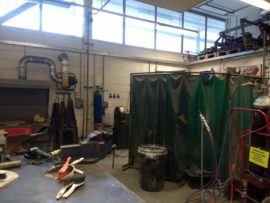 There is 1 full time technician, and other part time technical support and users must attend advanced inductions before accessing some of the larger pieces of machinery and welding kit. Eniola, who showed me round, estimated there was around a 60:40 ratio of (apologies for use of the terms) ‘professional’ to ‘hobbyist’ use. 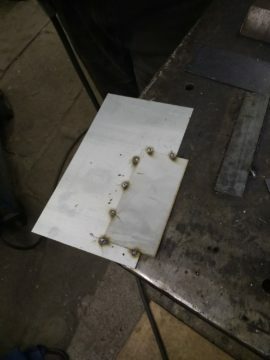 They get approached for fabrication work but don’t take it on due to capacity. The workshops also offer paid storage space for sheet material and works in progress for a daily fee. In terms of community engagement there is obviously the open access space and kit, workshop programme and there was also a café. 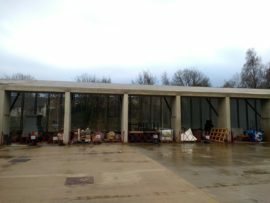 Things being built when I visited: exhibition furniture, a boat, furniture, sculpture. Left wanting to: set up a cafe at PW, start acquiring second hand equipment, do welding. Dan Brown and Irene Kernan very kindly shared a wealth of information with me when I visited Edinburgh Sculpture Workshop earlier this month. What I took away primarily is ESW’s focus on production, which is consistent through their programming in residencies and engagement activity. The building they inhabit is purpose built to deliver this, and includes the luxury of a loading bay and outdoor work space for hazardous work. Studios have heating and water, but holders are drawn from across disciplines too and can book additional project space against a daily rate. 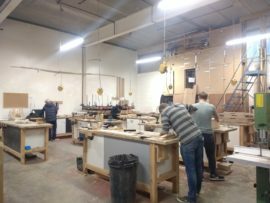 In terms of the workshops, technical staff are present 6 days a week, offering support and running metal, wood, ceramic and mixed media workshops. Workshop usage is open to anyone and is supplemented by an education programme. Dan explained how their outreach activities also enable them to work with young people who struggle in formal education and have a wider societal impact, but they also have a cafe, and hireable spaces. Things being built when I visited: a public art installation, mixed media sculpture. Left wanting to: change the world with making and/or sack everything off and move to Edinburgh. In the summer I visited Ruth Claxton and the proposed site for Birmingham Production Space in Digbeth, not far from East Side Projects. You can read the proposal for BPS here, it makes a very compelling case for the value of make space in the heart of the city, and specifically why Birmingham could be at the forefront of production in the UK. The approach here is very much cross-disciplinary, right through partners to the products, samples and works that would come out of these facilities, but also makes a convincing case in cross disciplinary production and econonmic growth. The funding bids and partnerships behind BPS are ambitious but have been informed by extensive research, including visits, a survey and ongoing dialogue with partners. CAD and analogue processes are earmarked across different spaces in the site of a former college in the project’s initial stages, and artists, designers, architects and much more are envisaged to use the space once up and running. Things being built: the development for the site is imminent. Left wanting to: be ambitious, be able to talk to council and professional bods in a language they understand, set up Make Works Manchester, or just sack it all off and move back to Birmingham. Ruth and the team are also behind Workshop Birmingham, expanding the Make Works model which started in Glasgow and seeks to put artists and makers in touch with industry. This is something to think about more in 2018, and I’ve got some time for planning in January which will help me reflect a bit more on my bursary activity. After this experience I’m keen to build blueprint ideas for production space into the programme at Paradise Works next year, and come up with a longer term proposal which will help communicate our aims to a wider audience so that we can help safeguard to presence of artists in the city. I’ve left the bursary feeling inspired by the potential for making to create dialogue across disciplines, sectors and walks of life, but of course this experience has also hammered home the importance of facilities in the creative, and professional, development for artists. I also remembered the captivation and frustration of learning a new skill and feel more keenly that working with professionals has a place alongside artist access to facilities. I’ve also left wanting a MIG welder, and I want to be able to play with process in a space where the outcomes, and the facilities, can be shared with a wider community. It all feels a bit blue sky at the moment but how to figure those small steps in the right direction for the new year is very much on my mind. Thanks for your support a-n, it is much appreciated. Training in silversmithing, and subsequently jibbing it off, means I’ve spent a lot of time looking at other processes from various other disciplines. So sometimes I feel like jack of all trades and master of none, and the commissions I’ve down have given me the budget to work with fabricators to create work. However, without a commission budget I can’t work in the same way and the materials and processes I use here are not translating to my studio practice. Conversely, I am not informing my commission work with an intuitive use of materiality that access to materials and equipment provides. My jump from small scale to large scale means I have an uneasy relationship with this and I’ve been wanting to take a bit of time out to develop my knowledge of larger scale processes for about 3 years now. 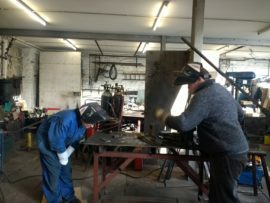 Last week I went to do an introductory welding course in Huddersfield with Julian Wadsworth. Fellow PW-er Precious Innes came along too, and was much better at welding than I was. The way that I expect metal to work kept tripping me up but I felt like I was beginning to crack it, and I liked the aggressiveness of the process. Me and Precious shared a similar experience of doing a short induction/making one component for a piece of work at university and then never getting further opportunity to develop that basic knowledge. Across a 9 hour workshop Julian introduced us to the basic joints and approaches to working steel at different angles and heights. 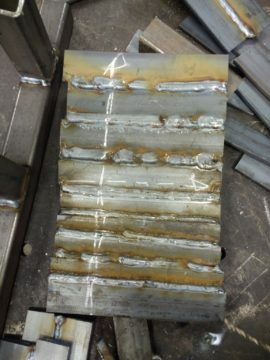 Obviously now I want a MIG welder so I can continue to work at it and really crack the process, but mostly to play and respond to the process itself. The workshop also confirmed to me that this is not about ‘making all the work myself’, a concept, that as a former craft practitioner, is a problematic (and not to mention boring) notion but having the means to understand it so it can inform the development of work. My residency at Quarry Bank Mill this summer saw me work with James Alderson/JPA Art Services who translated the subtle chaos of my approach to making into 3 works based on my ramblings, a small sample and an A4 drawing. 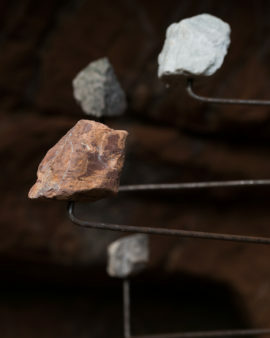 I feel that being able to sample at a larger scale using the right processes will help develop work which involves making throughout and bridges the theoretical gap between the small scale drawing, sample of idea of what something will look like and the reality of the material and how it responds to process at full scale. In terms of Paradise Works, we are working to create a sustainable space for ourselves in the city and there is a lot of potential in our building which we’re interested to explore with our landlord. In the immediate future I’m interested in creating a small shared workshop on our first floor and to coordinate a programme of skill-sharing and research visits. We are working on a proposal for our long term vision for the space in the new year which will help us build the network of partners that can help secure our future. I’m currently working out how this idea of production can be part of this. In 2015 we heard of a theory surrounding the movement of artists from Manchester city centre to create a place for production in Salford, and to think of the city centre as a place for the presentation or work. Being external to this dialogue, and also precariously hanging onto a studio in the city centre, meant this was not received well and it was something that I responded to through my curatorial practice at the time. Now I’m settling into Salford it’s an idea that I’m interested to revisit. The bid from which this idea originated, which included a fairly impressive list of partners, saw Contemporary Visual Arts Manchester (CVAM) commission a 3 week survey of arts production facilities in Salford and Greater Manchester. It was undertaken by Engine directors Ian Brownbill, Jai Redman from their base at Artwork Atelier, Sarie Mairs Slee with assistance from Suzy Prince. The bid behind the resulting report has since morphed into something else. 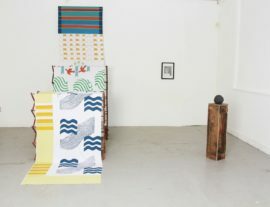 What can be taken from it however, is that it indirectly highlights the lack of production facilities for artists – a familiar story for many artists around the UK and beyond. Roughly these were listed under bronze casting, ceramics, stone masonry, woodwork. 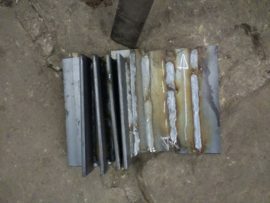 Metal work was also listed as offering limited facility. The 3 week turn around for the survey and the heartening development of facilities mean some of the findings are now outdated. In terms of woodwork there is PLANT and Makers Quarter, although these are more design oriented than sculptural. Manchester Pottery, Clay Studio and 7 Limes mean that access to ceramics is looking much healthier now. 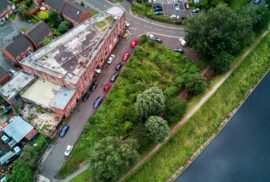 The ideas behind the survey can be clearly seen in the Make it in Salford proposal from Engine to create a sustainable place for artistic production and creative industry at Artwork Atelier. I’m hoping to speak to Ian and Jai about this as the future for their building is still uncertain and long term sustainability is a fairly crucial element to creating make space. 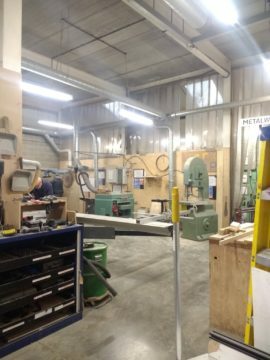 In May this year I went to visit M3 Industries, art fabricators and technicians based at Artwork Atelier who have a well kitted ground floor workshop for woodwork, laser cutting, welding and picture framing. To my knowledge Simon and Aaron have the closest thing to a dedicated art fabrication space in Manchester, with the exception of maybe Owl Project who have recently rebuilt heir space at Rogue’s new home in Openshaw. If you know of anyone else please shout? As the CVAM report points out these are spaces built by individuals for individual use, with kit built up based on the needs of specific practitioners. There is no space for artists to experiment with and respond intuitively to process beyond their own studio spaces. Particularly with the downsizing of AA2A locally there is even less access to fabrication space for artists after graduation. How can we continue to develop our knowledge of materials and process, and have this inform our creative development? This blog about my Professional Development Bursary is a little later than planned. When I wrote the application back in February there was quite a few unknowns that myself and the artists involved in the setting up of Paradise Works were soon to tackle. So, massive thanks to a-n for their support and for the opportunity to reflect on what we’ve done this year and figure out where we want to go, how we might get there, and what I want to do within my own practice. The bursary will enable me to explore open access space for making/production/fabrication (delete as appropriate) and develop my own skill set. I’ve come from a making background and I’ve been challenging the scale of my work for a while now, but my skill set, and the public commissions I have received, have meant I have worked with fabricators to make the work. I absolutely love working with others to make work but I do see a gap forming between this work and my studio practice, which has stayed relatively small scale. I now want to play and respond intuitively to materiality, and explore problem solving and playful authorship in larger scale making. The other key motivation behind this is my role with Paradise Works which has been borne out of a crisis in studio provision in Manchester and a desire to create a sustainable space for artistic production in the city. Before I left Rogue Artists’ Studios last year I curated a series of exhibition which examined what was being lost as the cogs of the city’s development creaked back into motion. My last show in December 2016, Division of Labour, explored historical production and threatened contemporary, fringe industries – of which, artistic production was one. My discussions with Hilary Jack during this programme informed our approach to Paradise Works, we feel strongly that artists need to assert their presence in the city and ensure their value and relevance is understood. Artistic production promotes diversity within the urban landscape and in turn, we are better enabled to develop sustainable careers through the audience, partners and network the city can offer. That said, the production facilities available to artists in Manchester is currently limited to our own kit or shared tools in studio spaces and small mixed-use workshops or specialist processes like woodwork and ceramics. Access to new processes, materials and skills, enables artists to develop the scale and ambition of their work, offering both creative and professional development. In turn, this surely helps us to assert our presence in the city, and perhaps make our activities more accessible? Needless to say, this blog will only scratch the surface of this but the bursary will enable me to develop these initial thoughts and define our long-term vision for Paradise Works. To do this I’ll be visiting spaces in Manchester, Edinburgh, Birmingham and London, but I’ll talk about that some more in that in the next blog post. Thanks for reading. Artist interested in people, place and process and co-director of Paradise Works, Salford.